How many year-round residents are there on Heir Island? Are there many holiday homes? How do you get things across to the island from the mainland? How do children go to school? How do the residents run the island? What kind of flora and fauna are on the island? 1. How many year-round residents are there on Heir Island? Heir Island has a year-round population of twenty-four. The youngest person as of 2018 is two years old. The population is made up of islanders, whose families have lived on the island for generations, and “blow-ins,” non-islanders from Ireland and beyond who fell in love with the island for one reason or another, enough to take the leap and establish their permanent homes here. We also probably have the most international and diverse community of all the West Cork Islands, with full time residents who were born in countries such as Taiwan, Thailand, Hong Kong and Singapore, and have lived in countries all over the world. 2. Are there many holiday homes? There are many families (mainly from Ireland, the UK and Germany) who own holiday homes on the island and visit the island every year. Some of these families have been visiting for three or four generations and established their holiday homes on the island as far back as fifty years ago before there were electricity and running water on the island. 3. How do people make a living? We have artists, boat makers, and craftspeople living year-round on the island. Our full time residents also run businesses like the Heir Island Sailing School, the Island Cottage Restaurant & Cookery School, the Mobius Leadership programme, and the Heir Island Retreat. We also have part time residents and holidaymakers who operate businesses on the island, such as Heir Island Holistics and the Firehouse Bakery and Baking School, which runs baking classes that are always booked up months in advance. There are lots more opportunities if one wants to make a life and earn a living on the island. Organic gardening (including hydroponics) could be a good option, as well as anything that has to do with nature conservation and biodiversity. Food culture can be an exciting venture. Anything to do with the internet and computers, such as blogging and e-commerce can be good options, too. All of the houses on the island can be equipped with high speed broadband through satellite and it works very well for anyone who needs to work from home. Lastly, there is good 4G mobile phone coverage everywhere on the island so you will never be cut off, unless you want to be. 4. How do you get things across to the island from the mainland? We get our supermarket orders delivered from Field’s of Skibbereen straight to our door, as much as three times a week during the summer. Mail and packages that come through An Post also get delivered to our door, as well as fuel, such as coal, peat, propane and oil. One would have to personally bring everything else across on the ferry or in your own boat. For larger and very heavy items, such as furniture and cars, there’s a barge that can booked for a reasonable charge. Heir Island National School closed in 1976. 5. How do children go to school? 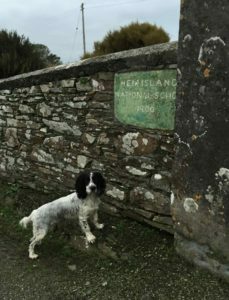 The Heir Island National School closed in 1976, so schoolchildren from the island attend schools on the mainland. They would take a special school ferry in the morning and afternoon, provided by the M.V. Thresher, and their parent(s) would drive them to school. Homeschooling and boarding school are other options for school-age children. 6. How do the residents run the island? The Heir Island Community Council is the governing body behind the island’s general operations. Membership of the Council consists of all those on Heir Island 18 years and older whose primary residence is on the island and whose names appear on the Electoral Register for the island as held by Cork County Council. Members are entitled to attend and vote at General Meetings, nominate candidates for, and to take part in the formation of the Management Committee, which consists of only one representative from each of the permanent households of Heir Island. Two year-round residents also represent Heir Island in the West Cork Islands Community Council. 7. What kind of flora and fauna are on the island? Check out our Nature page for more information and follow Heir Island Wildlife Project on Facebook and Instagram for regular updates on the island’s flora and fauna. 8. How do you dispose of rubbish? Residents usually dispose of food waste via composting. General rubbish and recycling are taken off the island by each household via the ferry and taken to various Civic Amenity Sites in the county. The closest Civic Amenity Sites to us are the one in Skibbereen on Marsh Road (which is free to enter and takes paper, plastics, glass, cans, clothing, biscuit tins, and used electronics) and in Derryconnell (which charges a small fee to enter, but will take almost everything). For more information, please visit the website of Cork County Council. Click here for the contact details and opening hours of various waste and recycling centres near us.